The Airbus A350 XWB is a widebody aircraft designed for medium- to long-haul airline operations. This new-generation jetliner entered commercial service in January 2015 and offers seating capacities between 250-440 with its three passenger versions: A350-800, A350-900 and A350-1000. The A350 XWB is designed to operate with 25 per cent lower fuel consumption compared to its current aluminium long-range competitors. The Ultra-Long Range configuration for the A350-900 has the capability to perform flights of up to 19 hours. 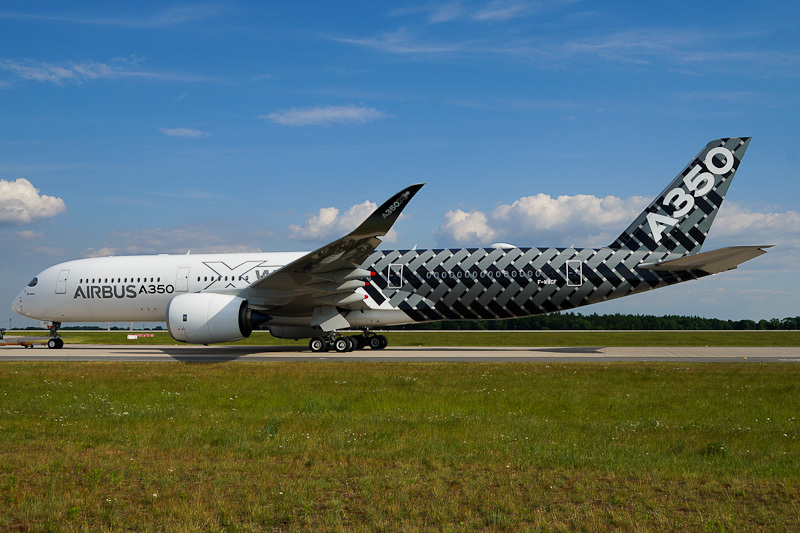 The 2014-built Airbus A350-941 c/n 002 F-WWCF flew first on 26 February 2014, and was the third A350XWB that flew. Airbus A350-941 F-WWCF is powered by two Rolls-Royce Trent XWB turbofan jet engines. The Trent XWB is the sixth generation of the Trent family of engines and is designed specifically for the Airbus A350 XWB family of aircraft. Until today, over 800 Airbus A350 XWB aircraft are ordered by airlines like KLM and other buyers. On 23 December 2014, the first Airbus A350XWB (A350-941 c/n 006) was delivered as A7-ALA to Qatar Airways. On 3 June 2016, Airbus A350-941 demonstrator F-WWCF was seen in carbon-look during the ILA Berlin Air Show 2016 at Berlin-Brandenburg / Willy Brandt International Airport.